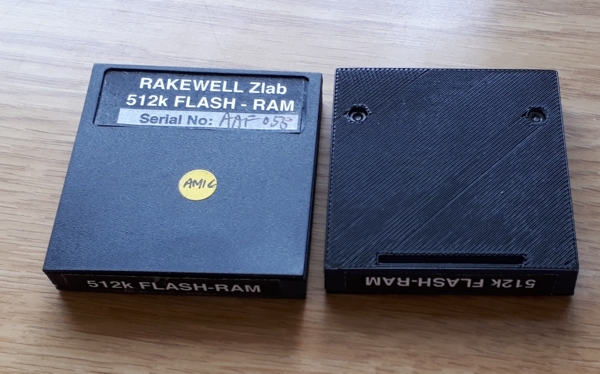 An enterprising Z88 User has designed a stronger case using nuts and bolts. 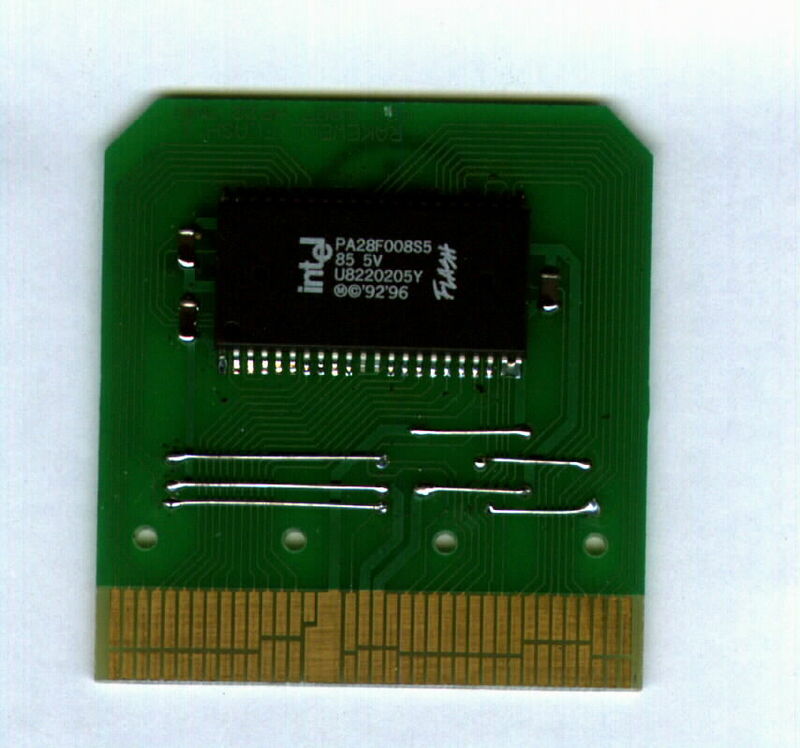 These are at the connector end replacing 2 of the pins, preventing the card from coming apart. This ensures that the 38 connections are made giving greater reliability. Initial tests are encouraging. If you are one of those users that experience this issue, consider changing the case. 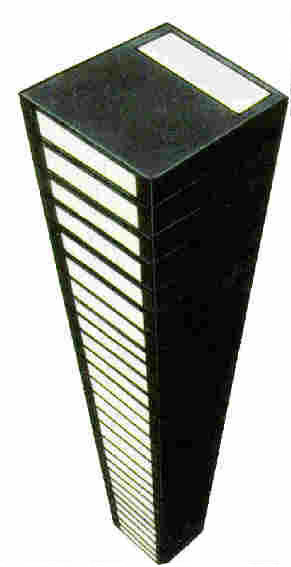 Note: The case supplied is fully closed.This picture is used to illustrate the way the two halves are bolted together. If you have a 3D printer download the design from here. On the other hand, if you are not experiencing problems, you could just to order a new Flash card. These have the latest case and software fitted as standard. Erase your existing flash card and use it to store extra files. For full details of the features and changes for OZ, please follow this link to the wiki site. This can be updated using the wiki, or we can do it for you. The 512K/512 Flash Turbo/RAM card was tested with OZ 4.7. Unfortunately it did not solve the issue. OZ 4.6.2 introduced several new features like installing an application in RAM. Whereas in the past, running applications like Flashstore or Pipedream in the 512K/512K Flash/RAM card worked well, intensive switching between the RAM and Flash areas in the same slot failed. The decoder in the standard card was thought to be fast enough. This was not the case. The problem was with the external cards as OZ 4.7 runs faultlessly in an internal Flash chip. This was solved with the new card cases. See above. There are two versions of software available for either the 1M and 512K Flash cards. The software supplied with OZ 3.0 includes Garry Lancaster's Forever compilation and the ZIP Utilities ROM. Some applications do not work correctly with OZ 4.7 as they were specifically designed to work with v3.00 and below. This is why there are two versions. 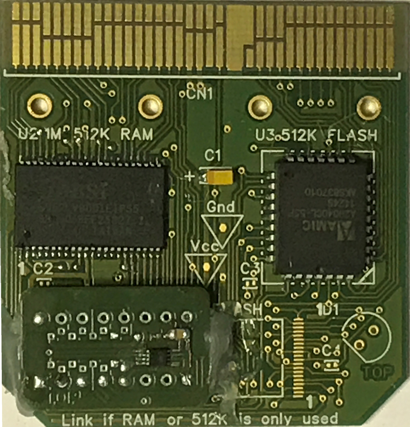 The 1M Flash card was redesigned to use the physically smaller size chip size allowing 1M Flash, 1M RAM - (low power) and 512K RAM/512K Flash cards to be offered from the same Printed Circuit Board. In the past you would have put your RAM in Slot 1, any extra applications in ROM in Slot 2 leaving Slot 3 for the EPROM to save files. Flashstore (which is required to read and write files to the flash card) is a 16K Application. The minimum amount of space for applications on the flash card is 64K. Other useful Applications have been added to use up the spare space. See Application 2006 for even MORE applications! When upgrading to OZ 4.7, you leave the original OZ and RAM in the Z88. Plug in the 512K Flash/RAM or 1M Flash in Slot 1, do a HARD RESET and your Z88 will run OZ from Slot 1. 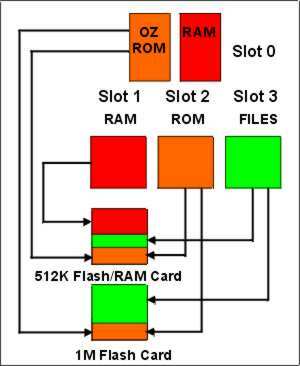 Using the 512K Flash/RAM Card allows you to run OZ, Additional Applications, Save files to the file area and have extra RAM all in the one card. This leaves 2 free slots for other cards. The amount of space you have left for saving files is shown in the table below. It is dependant on the size of the card and whether OZ 4.2 or above is supplied. After a period of around several years the Z88 development team bring you a long awaited new version of OZ, the Z88's operating system. 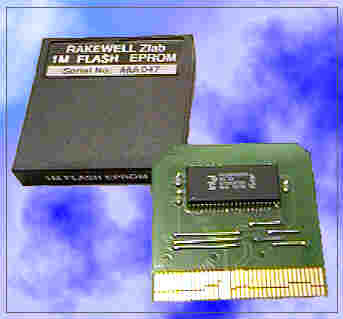 Using the 1M or 512K flash card, no modifications need to be made to your existing Z88 Computer, just plug the flash card in slot 1, your memory card in slot 2, do a HARD RESET and you are off with the new version. Two additional applications are included. 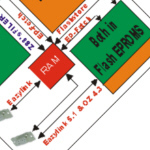 These are Flashstore and Eazylink (just the Z88 application. The PC program still needs to be purchased if required). For further details about this on-going development just give us a call for a chat! We will supply either version for no extra charge. Providing you have a Z88 with at least 256K of memory and a flash card you can download and install it yourself. Click here to go to RomUpdate. There are a number of applications that will not run under OZ 4.2 or above. These are all of RANGER applications and those that patch directly into OZ 3.0. Works like a charm! I am very impressed - I love the Z88 and with 1 MB to play with as well as easy erasing, I am very happy. I now have a problem though - what to do with my old EPROM! Just one of the comments from our users about the 1M Flash Card pack when it just came out in 1997 (For more comments - see the Reviews section). 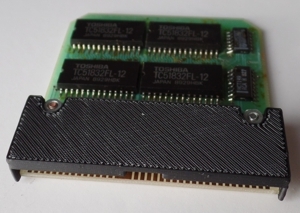 This is a high-capacity low priced storage card that fits either into any slot on the Z88. Just like the old EPROM packs it does not lose its data when it is removed or if power is lost from the Z88. There are two versions of the flash card available. 2. OZ 4.7 Version - which has the same applications as above and OZ 4.7. 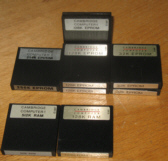 The highlighted applications mark the range supplied on the Z88 with each version of OZ. NOTE: References to OZ 4.3 should now be OZ 4.7. These updates attract an extra cost. Users may return their Flash cards with their remittance and postage (currently �36 inc VAT). Save or Fetch files directly to the Flash card with this Eazylink upgrade. Avoid using RAM space just as a bridge between the two. 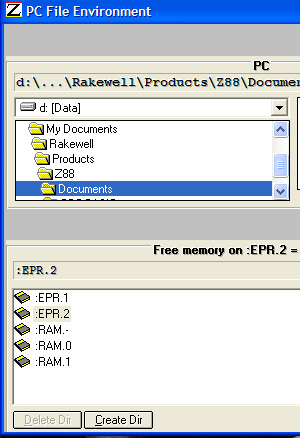 The file areas look like RAM and are labeled :EPR.1, :EPR.2 and :EPR.3 depending which slot is used. The software on the PC remains unaltered. When using these updates the view in Eazylink will display any formatted file areas and their contents on the Flash card. By marking the files, they can be transferred to the PC just as if they were in RAM. If Eazylink displays its version number in the left-hand bottom corner, it can read / write to the flash file area directly. Click here to see a small movie of the HELP added. To read more about the applications supplied, click on the names below.